Fr. 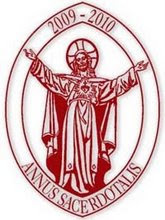 Tim gave a talk on Summorum Pontificum and afterwards celebrated a Mass according to the usus antiquior for a pilgrimage group at Aylesford last Thursday. 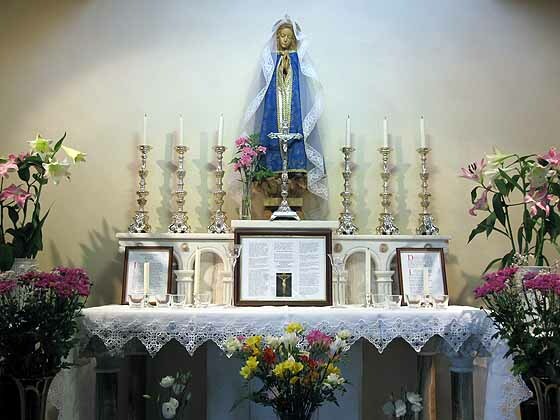 The Mass was a votive one for Our Lady of Mount Carmel, and since Aylesford is the Marian Shrine of the Archdiocese of Southwark, the vestments used were a special blue set... some sort of indult is necessary for the use of blue, apparently. I liked the colour, but didn't think much of the actual vestments. I definitely prefer the Roman style rather than the Gothic. Anyway, this was an almost perfect photo opportunity for me - if the weather hadn't been so ghastly I'd have taken some more photos of the Priory itself. The Mass propers were chanted by two gentlemen from Charles Finch's schola: at one point the MC was asking me if I'd be able to step in and improvise something along a psalm tone, because Charles and the others had been seriously delayed by some sort of hold-up on the M25. Fortunately, the singers arrived with about two minutes to spare! I put a small selection of photos up on my Flickr page, but, as it's been a while since I made any slide-show "videos" for You Tube, I might do one of those too... after all, it's a shame not to make use of all those photos! I have to say that I get a great deal of satisfaction from taking these photos. I have decided that my next project is to save for a really snazzy "proper" camera so that I can do a bit more. Watch this space! 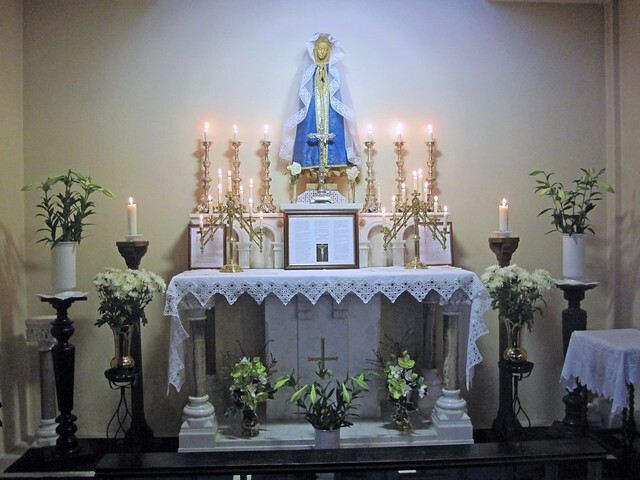 I'm a little late getting these up, but it was such a wonderful Feast Day - and it's within the Octave!! I think the Assumption is one of my favourite feasts. After all, it just seems so right... if you were able to spare your mother the pains of death, of the separation of body and soul, wouldn't you want to do that? Signum magnum apparuit in caelo: mulier amicta sole, et luna sub pedibus ejus, et in capite ejus corona duodecim. 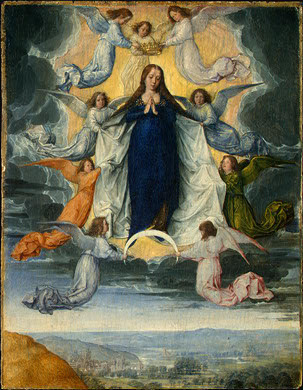 A great sign appeared in heaven: a woman clothed with the sun, and the moon under her feet, and on her head a crown of twelve stars. This Saturday, 20th August, there is to be a pro-life outreach event in Stratford. It will be similar to the very successful one held in Lewisham last month. Newham Borough in East London has the highest abortion rate in the U.K. (39.9 per 1000 women) and has the sixth highest number in Europe, with 2,341 abortions taking place every year. BPAS have recently opened a new abortion centre in the area, and so the Society for the Protection of Unborn Children will be doing a pro-life outreach there. The aims are to inform the local public about the positive pro-life services available, raise awareness about exactly what is happening in the area, and campaign against the new opening. Help is needed to man the stall, distribute pro-life literature and engage with the public. Meet outside Stratford Tube Station at 10.30am. 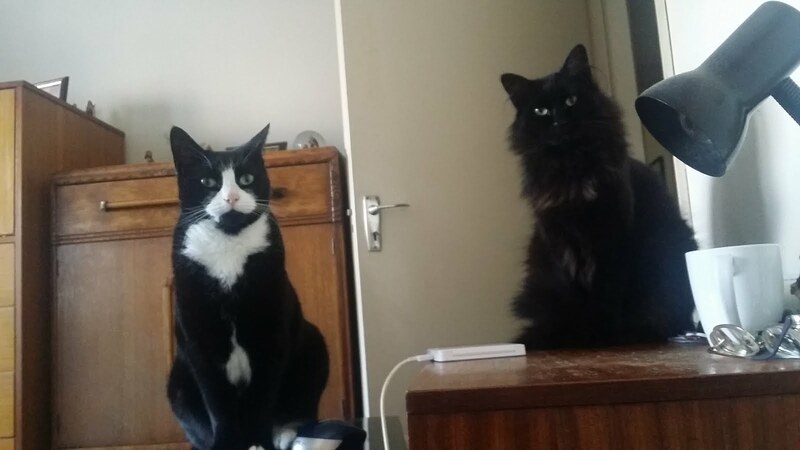 It will finish no later than 2pm. Any queries please contact: 0207 820 3140. There was a Facebook event page mentioned, but the link given appears to be faulty. However, you can contact any of the organisers by email - Daniel Blackman, Anna Gomes, Frances Roxburgh, Daniel Loughnane, or Paul Smeaton. My Reflective Mood post generated a rather pertinent comment, which I felt had to be given a wider airing, as it exemplifies one of the misconceptions which many people have about the Extraordinary Form of Mass. I think I need to nail my colours to the mast, so that my comments have some sort of context. First of all, I've said it before, and it bears repeating: I am no expert liturgist. 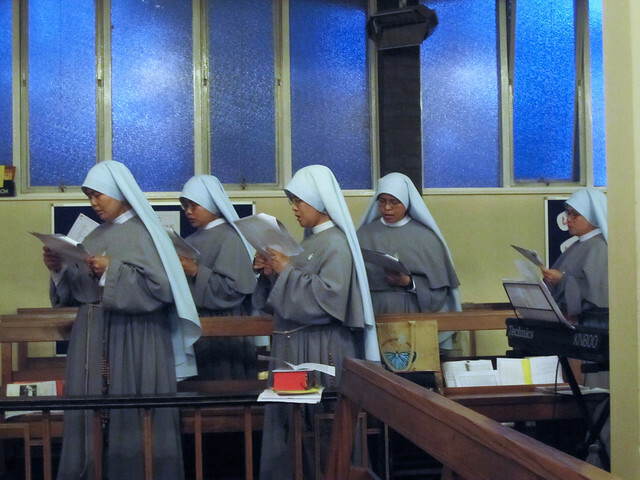 I am not a trained musician - though I do love to sing (and I think I have quite a nice voice) and I did organise the choir for many years at a previous parish I attended, so I got fed the standard liturgical line (mumbo-jumbo) for the celebration of the Novus Ordo. I have even been a Euphemistic Monster (please don't hurt me, I can explain!) and I am still a reader. 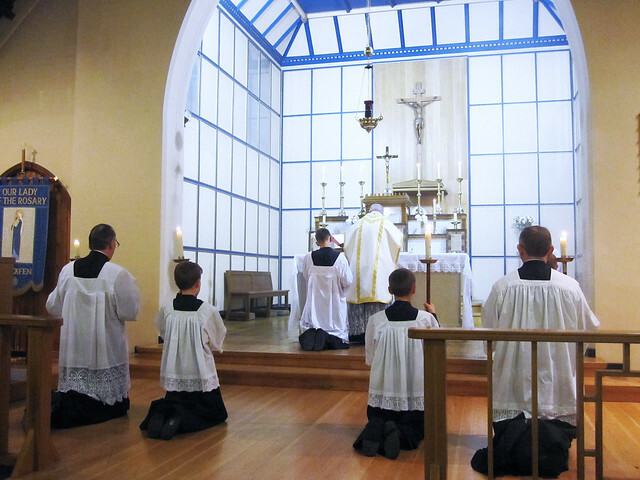 I have no doubts about the validity of the Novus Ordo Mass, I just prefer the Extraordinary Form. 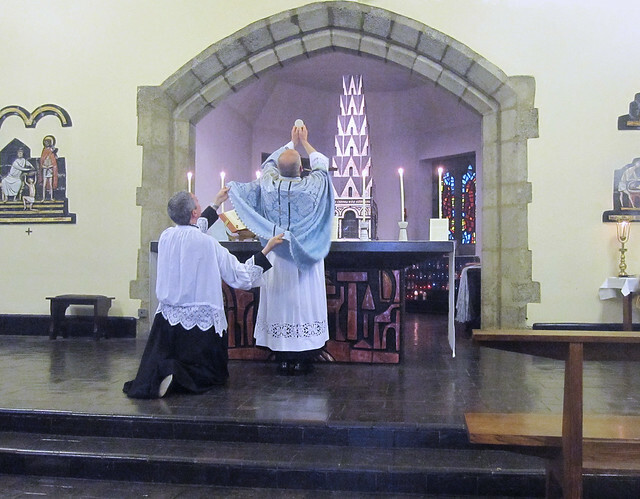 In my opinion, there is so much more to the traditional liturgy. A simple analogy will demonstrate my present attitude - both McDonalds and Café Rouge serve food, but, given a completely free choice, I know which food I'd rather have! 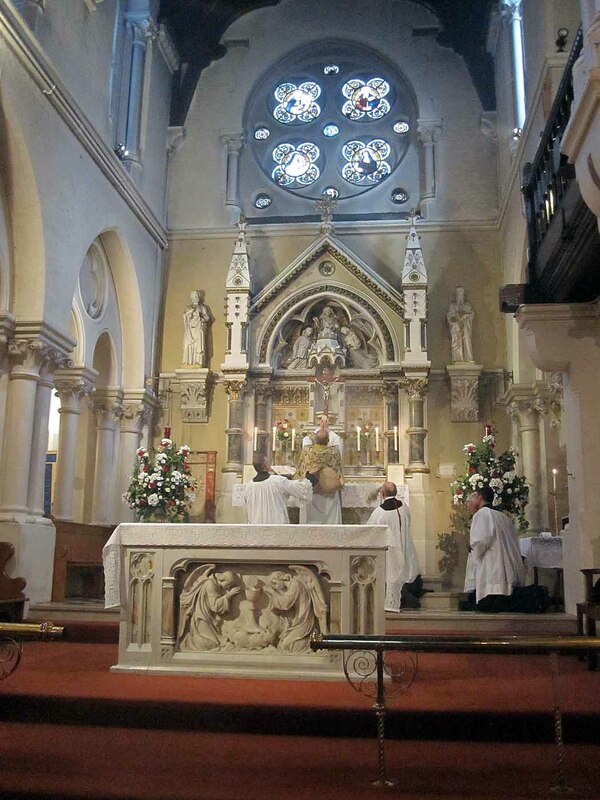 I am a relative newcomer to the Extraordinary Form, and, unlike many people who have put much time and effort into finding a "Latin Mass" each Sunday, travelling many miles in order to attend one, I tend to go mainly to my own parish church. I do realise how fortunate I am in this respect! 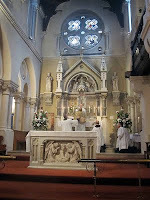 I often attend the Sunday evening Mass in my parish as well as the Extraordinary Form Mass in the morning (I help in the Sacristy, and often set up and clear away for this Mass) I don't state this in order to boast, but merely to demonstrate that I am used to attending both forms of the Latin Rite. It was interesting that you mentioned that not having to join in with the responses in the Extraordinary Form Mass fitted your mood. Is it usual for the congregation at Extraordinary Form Masses not to join in the responses? At the handful (four or five) of Extraordinary Form Masses I have attended, I have attempted to join in the responses in my best Latin (which is not very good, I admit: I speak Portuguese, Spanish and French to varying degrees, but have never learned Latin), but I am perplexed that as a rule, the rest of the congregation (other than the choir) does not do so. Why is that so? Even the Latin versions of the Creed and the Our Father are said too quickly for the congregation to follow along if they wished -- and I would think that those prayers should be said in common by the entire congregation at every Sunday Mass! At a Missa Cantata, it's pretty much the same, except that the priest chants the Epistle and Gospel. In both cases, there is no obligation for the congregation to join in with any responses, though they usually do, and generally with far more gusto than is observed at many Novus Ordo celebrations. Hearing our parish congregation belt out Credo I is quite uplifting! 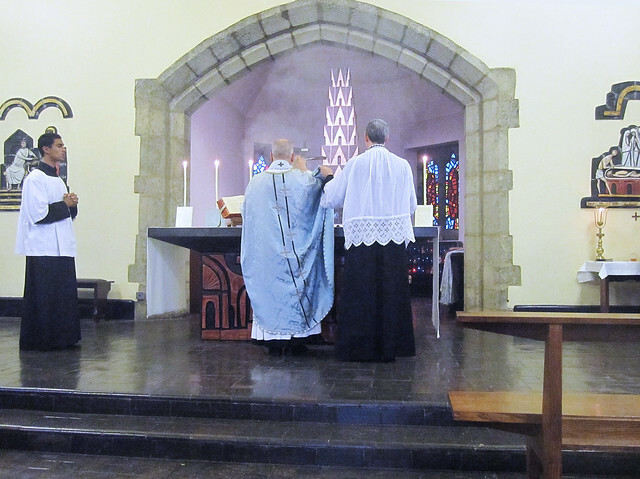 Occasionally, and usually at a Solemn High Mass, the Mass setting is a polyphonic one, and not really suitable for the congregation to join in. Before anyone gets upset about it, this is frequently the case at places like Westminster Cathedral even at Ordinary Form Masses. 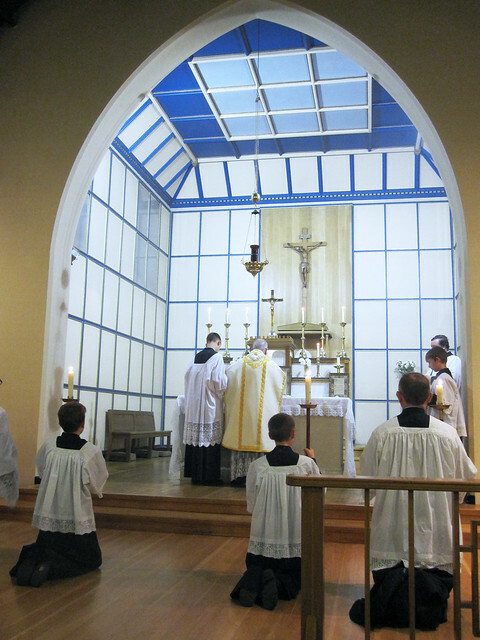 Low Mass is where the lack of overt congregational response is most noticeable. 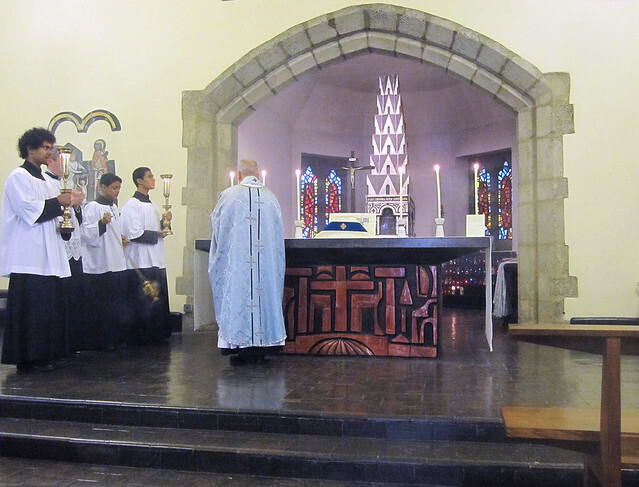 During Low Mass, the server makes the responses on behalf of the congregation. The priest is praying, as I understand it, in persona Christi, interceding to the Father on our behalf. The prayers are said quietly. In some countries, I believe, the practice of a "Dialogue Mass" has become the norm - a sort of halfway house between the Ordinary and Extraordinary Forms - where the congregation make the responses with the server, but this is rare. It also seems (to me) to defeat the idea behind Low Mass, and turns it into a competition to see who knows enough Latin to keep up! 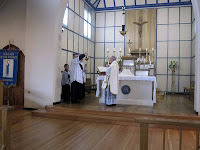 Occasionally, one can find Low Mass with hymns - but the hymns are sung while the priest is continuing to pray the Mass, unlike the Novus Ordo where everything stops while the hymn is sung. At any of these Masses, it is not obligatory for the congregation to "join in" with the responses. 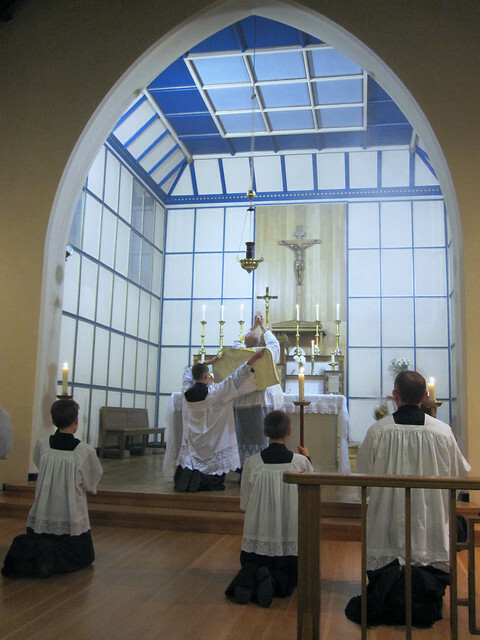 Which leads us to the consideration of what is meant by "active participation" at Mass. The main problem with viewing active participation as "doing something" is that only a minority of people have anything to "do" at Mass - hence the proliferation of EMHCs, readers (sometimes, particularly at school Masses, this can degenerate into having different children each reading a single verse of the responsorial psalm, so that everyone can take part) meeters and greeters, and so on. But the vast majority of people at Mass don't have one of these roles, so to view active participation in this way is to dismiss the vast majority of mass-goers as not participating fully. It also completely denigrates the role of laypeople in the centuries prior to Vatican II, none of whom would have had anything to "do" at Mass. Even if one extends the "doing something" to "saying something," this causes problems. 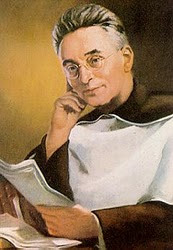 If one attends a Mass in another country, one cannot necessarily speak the language, or even understand what is said. So does that mean one is not actively participating in Mass? Active participation does not mean "doing something." It doesn't even mean "saying" something. 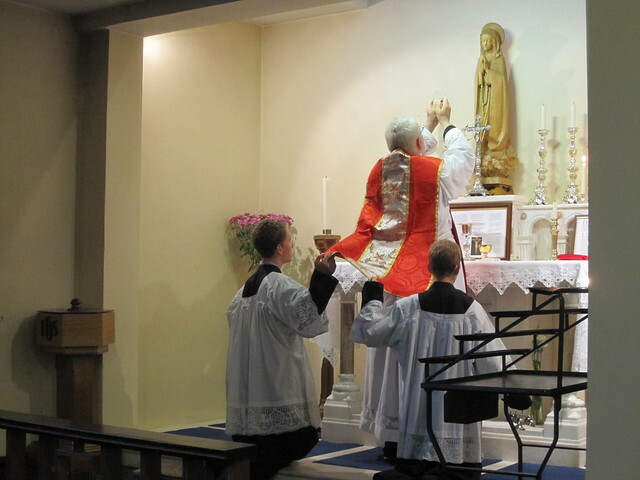 Active participation means being present with the intention to offer praise and worship to God and uniting oneself spiritually to the sacrifice of the Mass. Fr. Tim gave a very helpful summary of what active participation is in a post on the benefits of the Mass. 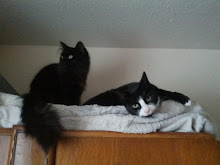 Now, on a more personal level, I find that my own active participation may change, depending on my mood. This mostly applies to my experiences at Low Mass - at a Solemn High Mass or a Missa Cantata I usually sing along with any bits I can, though not always. Sometimes I want to follow the whole Mass word-for-word, making the responses (whispering them, or just mouthing them, so as not to disturb anyone else) and for this I use a Missal. 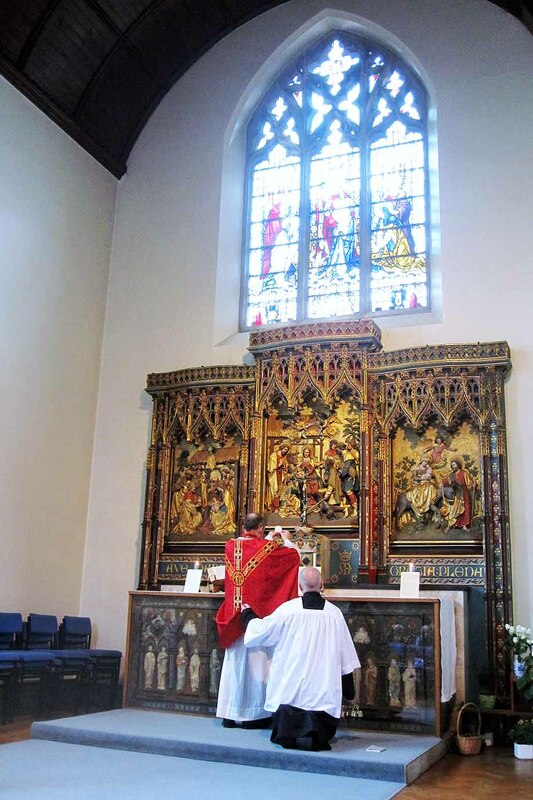 It takes a while to get familiar with all the different sections of the Missal for anyone brought up on the Novus Ordo, but it's not impossible. Sometimes I use one of the "schemes" for following Mass given by one of the saints. Before I encountered the Extraordinary Form, I used to look at the prayers for Communion written by many of the saints and wonder how people ever managed to complete them in the time - now I realise that these were designed to be prayed during the Mass, as reflections to focus the mind as the liturgy progressed. Some of them have helpful pointers, such as "while the priest makes the preparatory prayers" or "during the priest's Communion" and so on. Occasionally I am in the mood to meditate on the Mysteries of Our Lord's life, death and Resurrection as given in the Rosary, and so I will pray that way. Sometimes I just want to sit in the presence of God, and pray in my own words. It is in that sort of mood that I want to look at beautiful statues and stained glass windows, to reflect on the people who made them and the truths which they were attempting to convey through their artistry and skill. One objection to all this is the tendency to suffer distractions. However, I find that I am just as prone to suffer distractions in the Novus Ordo - reciting the Creed out loud doesn't prevent me from suddenly wondering what lessons I need to prepare for the following day, or what I want to cook for dinner. I have even suddenly found that I don't recall praying the Gloria - despite having done so, out loud, along with everyone else. Others object that it is important for all the congregation to pray the same thing during the Mass. Why? Just because we all pray the same words out loud doesn't mean we are all thinking exactly the same thing. And at the Extraordinary Form of Mass we are all there for the same reason, and all our prayers are united and offered to God the Father on our behalf by the priest, so we are all praying together. The organs of the body all do different things within that body, but it is still one body. And, after all, we are the Body of Christ! 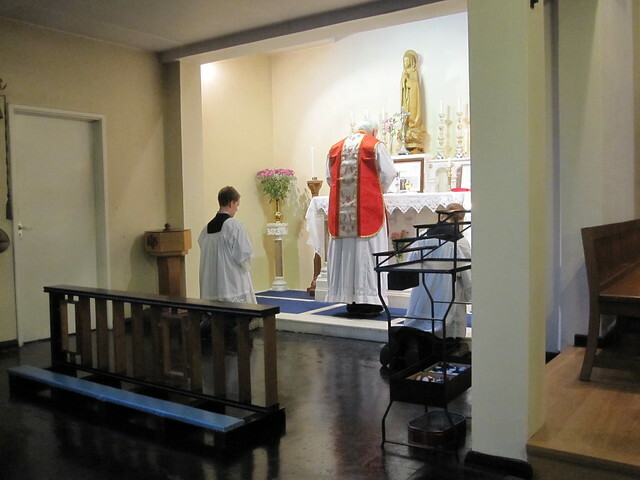 Low Mass does take some considerable effort on the behalf of most of us who have been brought up with the Novus Ordo - the silence and stillness does take some getting used to, especially as we have been trained to think that silence and stillness equates with doing nothing. Once that hurdle has been overcome, the greater freedom allowed by the Extraordinary Form becomes very precious indeed.